So everyone knows I love entertaining and making food look beautiful. The item I’ve probably had the most practice on over the years are fruit and vegetable trays. I used to work for BYU catering where we made hundreds of fruit trays. It was there I learned how to cut a pineapple and could get a pineapple cored and cut in about a minute. Soon after college I got introduced to the Barefoot Contessa and her amazing fruit platters always filled me with glee. They just looked so pretty :). Granted she has food stylists and a bevy of helpers (not too mention quite the budget) but I think if you invited Ina Garten to a party she’d bring about as pretty a fruit tray as shown in the pictures. Incidentally I wonder if Ina Garten’s friends are terrified to invite her over to eat. How could you measure up? Anyway, I started a diet on Monday and had to bring a treat to activity days for the young girls at church. (Age 8-10). I couldn’t think of anything that wouldn’t derail my diet and as I had been a slacker leader the last few months store bought seemed too lame. 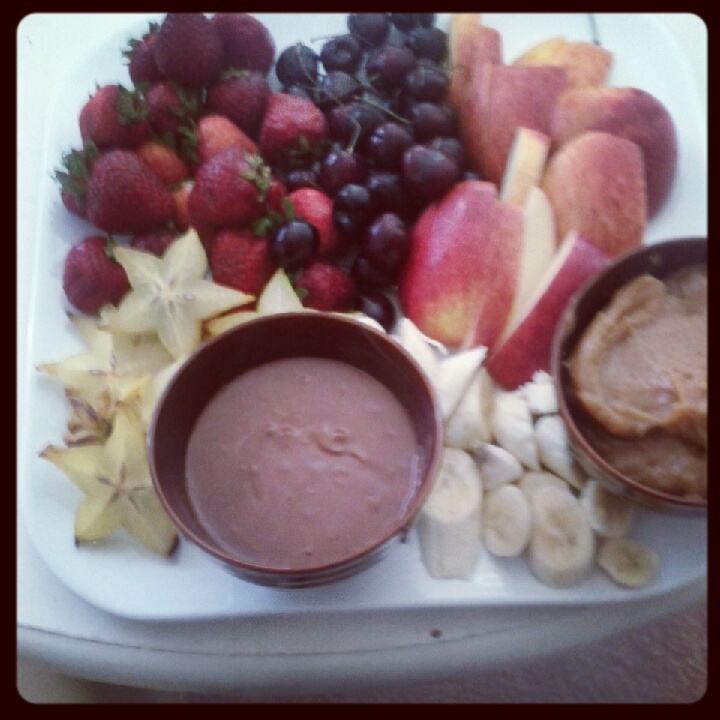 So I decided to put together a fruit tray with my famous chocolate yogurt dip (so good!). Isn’t it pretty? White platters are easy to use for any occasion. The best entertaining tip my Mom gave me. The fruit tray included strawberries, cherries, envy apples, banana and just for fun star fruit. I had my chocolate dip (recipe below) and some store-bought caramel sauce (I’ve never quite mastered homemade caramel sauce). I didn’t know if the girls would like the dark chocolate sauce but I think you can tell from this after shot that they liked it! That’s what you call a plate licked clean! “Once the base is set, you can add any kind of fruit that’s available. I like to have one thing that is taller than the rest, such as a large bunch of grapes or a decoratively cut papaya, to give the platter height. Then I add raspberries, strawberries, blueberries and fresh figs in casual but organized groups. The platter can look like a bowl of M&M’s if there are too many colors scattered with no order. Visually, your eye needs to have a focal point and to be able to see each type of fruit. 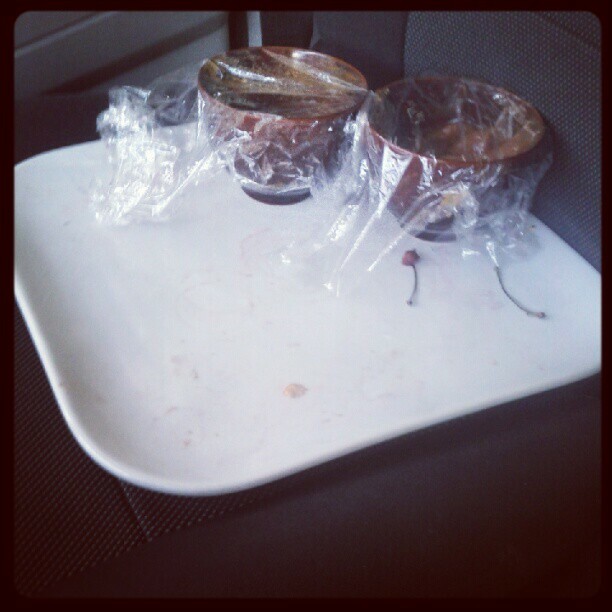 Some day I will be so on the ball I have lemon leaves on my trays but I’m proud of my attempt. I think even kids respond better to something that is presented beautifully and it really doesn’t taken any more effort than throwing it on a plate. Ok maybe a tiny bit more effort but hardly anything. Here’s the recipe for the chocolate sauce. Its super good. This makes a lot of sauce. 3 Lindt Dark Chocolate Bars- Lindt has tons of flavors including roasted almond, sea salt, chili, mint etc. They are the best! heat chocolate over double boiler until melted. Add milk, mix together over heat. Will get a little thicker as it heats up. 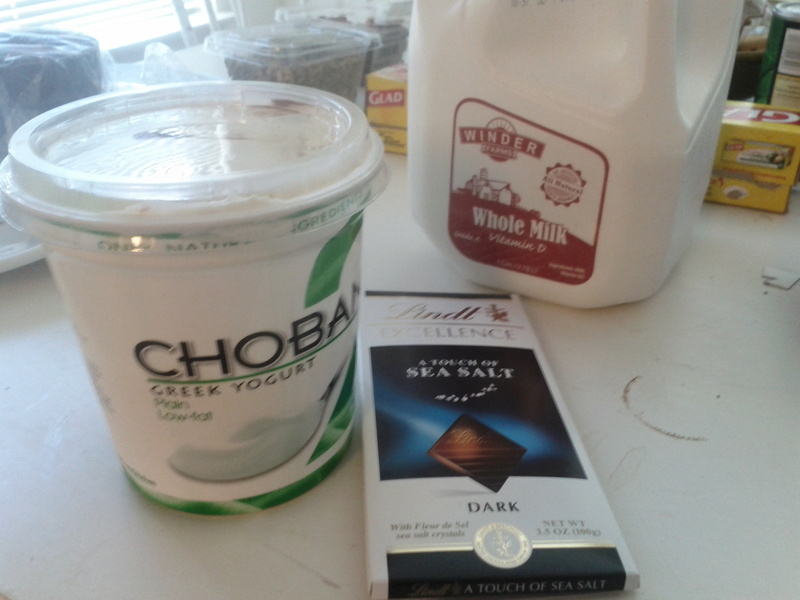 Add yogurt once its cooled down. 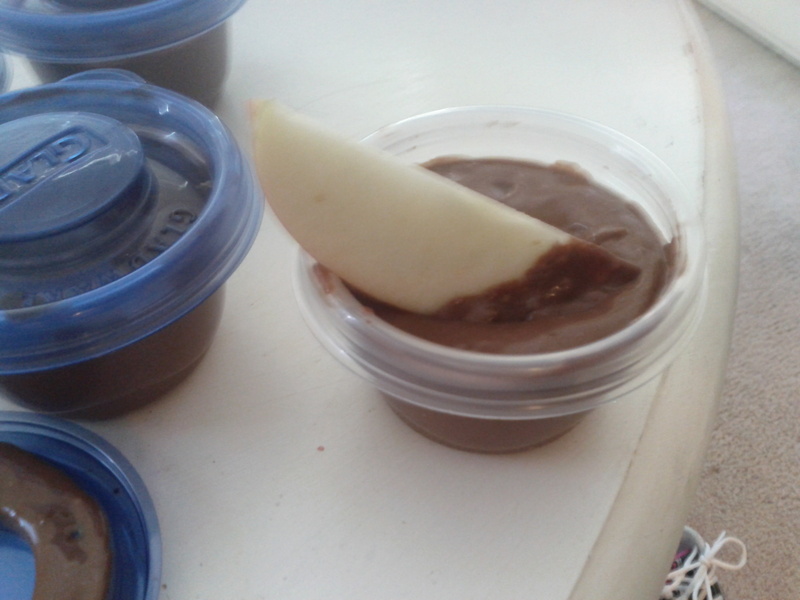 Since I was making this for kids I added about a tsp of agave to make it a little sweeter. You can add chopped nuts, toffee bits or whatever you like. Can dip anything in it. Shortbread is amazing! 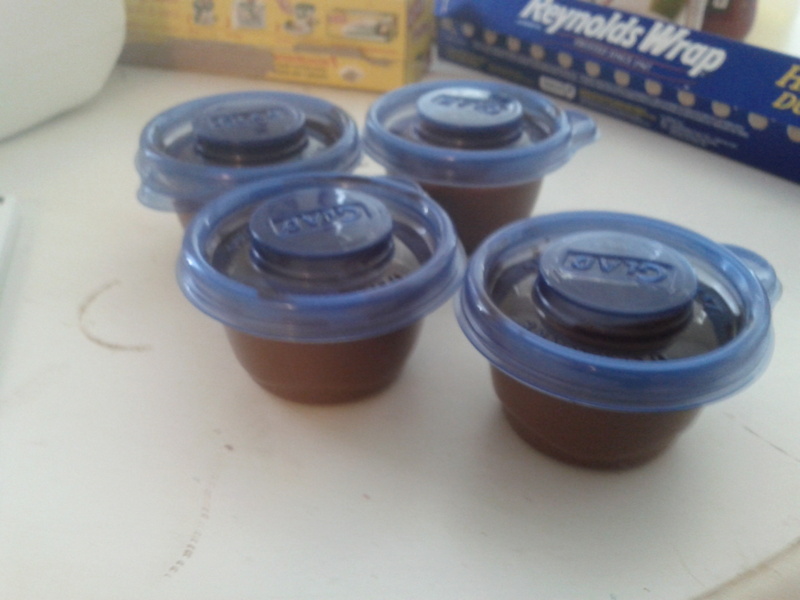 I made enough this time that I am setting little servings of it aside and freezing them for a quick treat. As best as I can calculate on myfitnesspal.com these servings have 120 calories, 18 carbs, 8 grams fat, 6 grams protein, 11 grams sugar.